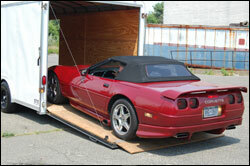 Almost Home Moving and Storage also provides enclosed Auto Transport. We know that sometimes its hard to simply drive your car to its destination, sometimes in a household you have more cars than drivers, or if you’re a collector you don’t want to put miles on your numbers matching car, whatever the case may be Almost Home knows the importance of getting your car to its destination safely and on time. With our enclosed trailers and GPS tracking trucks you will always be in touch with where your assets are. Our car trailers are single car enclosed and the reason we like these is because sometimes mileage is of the utmost importance for you. collectors out there putting a tenth of a mile here and a tenth of a mile there could add up to a considerable loss on profit. Having the ability to back up to a garage up a windy driveway to me makes a world of difference rather than leaving the a large trailer in the street and driving your collectable up. Almost Home also has an Auto Storage Facility that is secure, climate controlled, and electronically monitored. 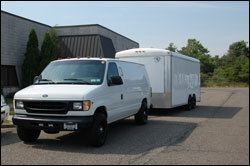 It has a 14ft rollup door so the transport trailer backs right in to unload your vehicle. Your car will never be exposed to the outside environment. We also offer car detailing to get the car ready for whatever occasion may pop up.